Wake up to a stack of Whole Wheat Blueberry Granola Pancakes! The best way to start the day! I’ve always been a morning person. I love waking up early to get my day going. During the summer, I was waking up around 5:30 to go running outside. Well, within the past couple of weeks my morning light has disappeared and the mornings have become chilly. I don’t like to run in the dark by myself, so I have been using our elliptical or waiting to run a little later. The other day I was waiting to go on my run and decided to make breakfast with my boys. Caleb asked for pancakes so we made Whole Wheat Blueberry Granola Pancakes and watched Curious George. 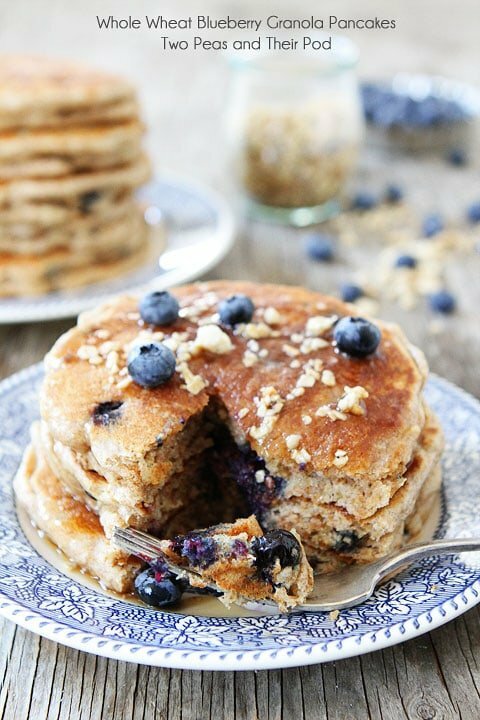 Blueberry pancakes are always a favorite. 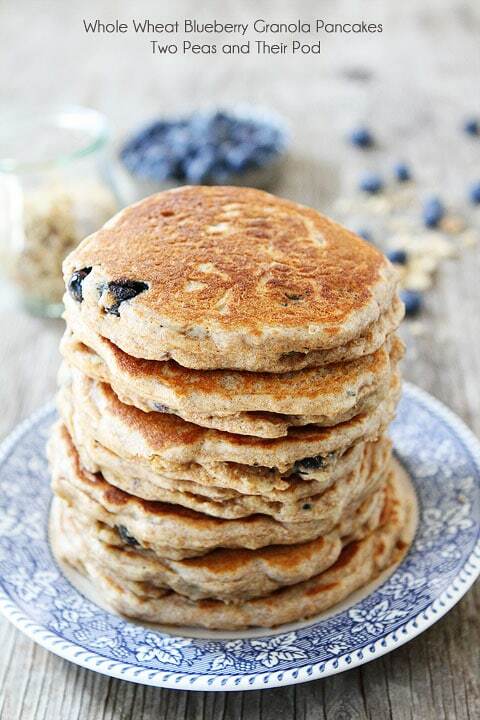 You can’t go wrong by adding plump juicy blueberries to whole wheat pancake batter! 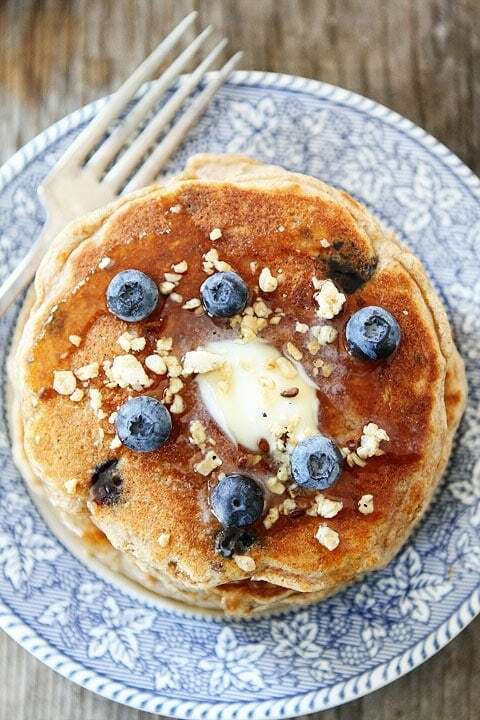 I made these pancakes even better by adding NatureBox’s Wild Blueberry Flax Granola. We love snacking on the granola or eating it with yogurt, so why not add it to pancakes? Best decision ever! The granola added flavor and a slight crunch to the pancakes. I wanted to eat that big stack of pancakes all by myself! Luckily, my boys helped me eat them! We topped the pancakes with butter, maple syrup, extra blueberries and granola. Whole Wheat Blueberry Granola Pancakes were the perfect way to start the day. Plus, they gave me lots of energy to go on my mid-morning run! It was a win-win kind of morning! We made a big batch so we could put some pancakes in the freezer. Caleb asks for blueberry pancakes almost every day and now he can have them without any work! 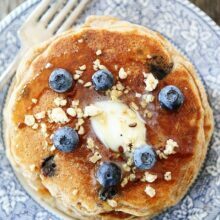 I highly recommend you try the Wild Blueberry Flax Granola so you can make these incredible Whole Wheat Blueberry Granola Pancakes! They are all kinds of awesome! 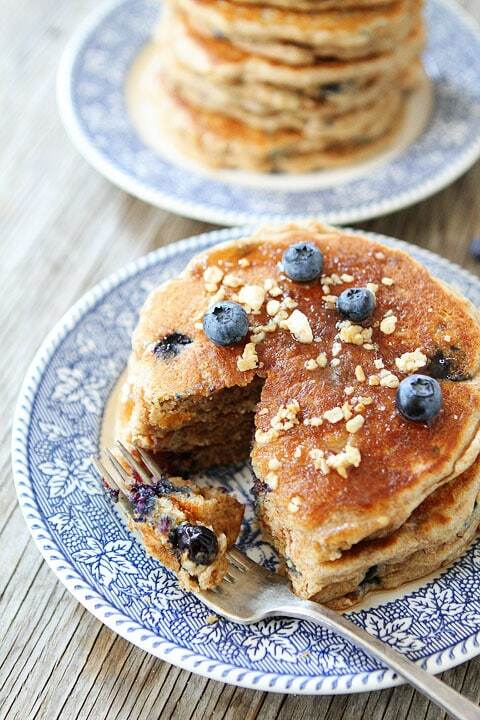 Whole wheat pancakes with blueberries and granola! Our family loves these pancakes! In a large bowl, whisk together flour, sugar, baking powder, soda, and salt. In a small bowl, whisk together buttermilk, eggs, oil, and vanilla. Add wet ingredients to the flour mixture and stir just until combined. Do not over mix. Gently stir in the blueberries and granola. The batter will be slightly lumpy. Heat a griddle or pan to medium low heat. Coat with cooking spray. Drop about a 1/4 cup of batter onto heated skillet. Cook until surface of pancakes have some bubbles and a few have burst, 1 to 2 minutes. Flip carefully with a spatula, and cook until browned on the underside, 1 to 2 minutes more. Continue making pancakes until the batter is gone. Serve warm with butter and maple syrup, if desired. Disclosure-this post is sponsored by NatureBox, but our opinions are our own. I love the idea of adding granola to pancakes! This is so fun! 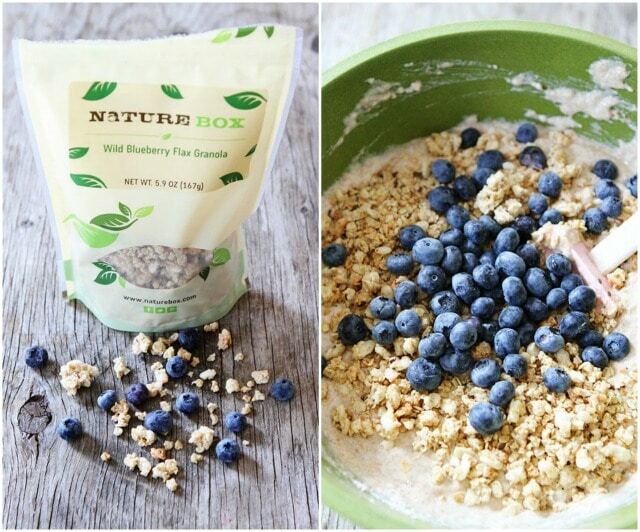 I love my Nature Box and I love the idea of using granola in pancakes! This month I got sent French Toast Granola! I think I’ll make pancakes with it!! Great recipe! Granola ALWAYS makes blueberry pancakes taste better! We have a local breakfast cafe called Le Peep that serves “Granola Blues” blueberry and granola pancakes. So much fun to make them at home! Cannot wait to try Nature Box. Thanks for sharing, Maria. Pinning! I am so on board with these pancakes! Yum-O! LOVE whole wheat pancakes, I’ve never had blueberry ones. Can’t wait to make these! Probably for dinner, yum! The texture of these sounds incredible! I love the idea of granola in a pancake! I love that you made these and watched Curious George! 🙂 The Nature Box granola sounds yummy in there. Such pretty pancakes. I’d love a stack of these too. My grandson is a huge Curious George fan right now too. Love the sound of granola in pancakes! Oh my! My son wants these right now. That is one gorgeous stack!! They look fabulous and healthy. 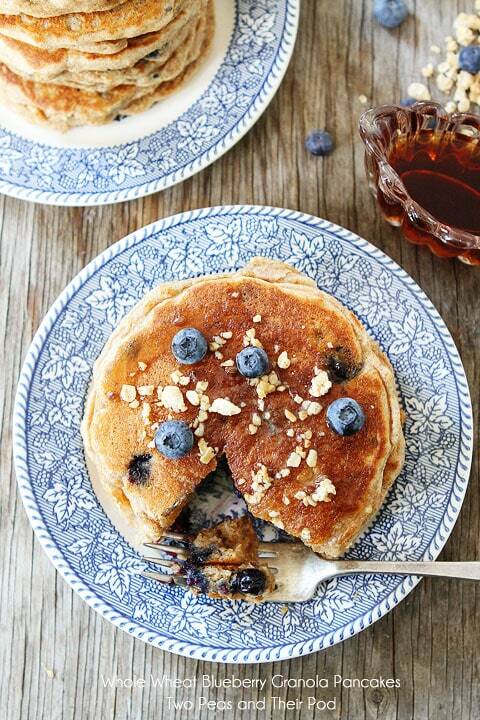 Blueberries add a beautiful touch to pancakes. Looking forward to trying these! Those look like some yummy, fat pancakes! 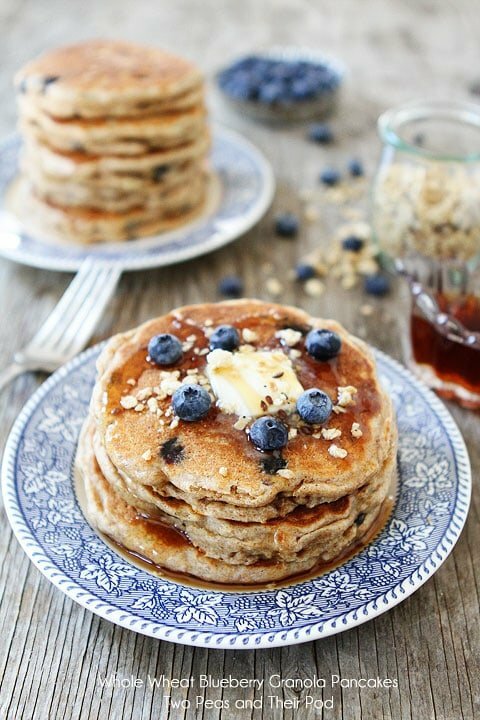 Never thought of granola in pancakes…but that sounds like something that needs to happen! yum! I absolutely adore blueberry pancakes. Amping them up with granola is a fabulous idea! 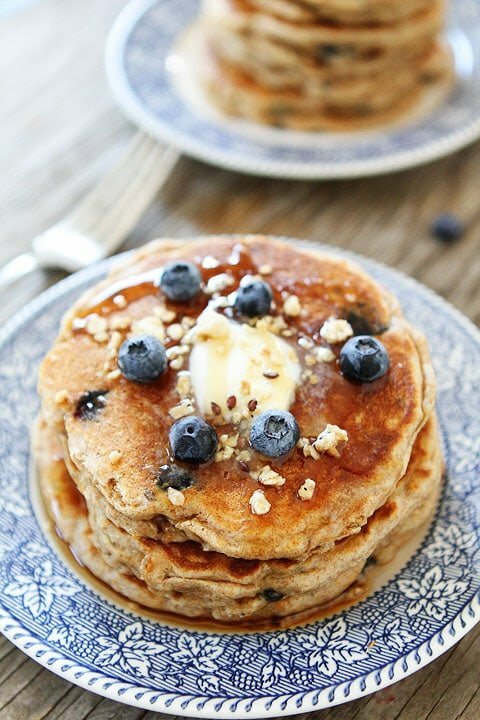 I will never say no to a big stack of blueberry pancakes! These must be actioned! I want you to come make breakfast at MY house!! I used to work at a place that served pancakes and granola. Someone used to always come in and ask us to make granola pancakes. I was always so annoyed since who orders something completely not on the menu but it was genius. So yummy! These look so deeeelicious. Love blueberries. love granola. love pancakes. So I am pretty positive I will love these 🙂 Good work! FYI – Nature Box’s website says that if you use a discount code, they add $1.96 for shipping. I just know I would love those crunchy granola bits next to those juicy bluebs! The perfect breakfast treat! I’ve never had whole wheat blueberry pancakes. These looks so delicious! Yum, yum, yum! These look absolutely perfect! 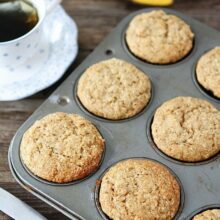 Just made these for a late breakfast… Duuuuuuude! Ah-mazing!!! These look wonderful, Maria! Love the addition of the granola! Gorgeous pancakes, I love how fluffy they look! These look yummy! And believe it or not someday he will not want to watch Curious George anymore and you will find yourself missing that silly monkey. 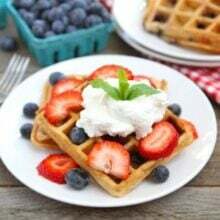 🙂 I was wondering about the buttermilk in these and other recipes you have posted. Do you ever substitute sour milk (with lemon juice or vinegar) for the buttermilk, and do you think it tastes just as good? And do you need to make any changes if you substitute regular milk? Thank you. I absolutely love blueberry pancakes, and this recipes helps me justify it. Thanks for sharing! Just made these yummy pancakes and they were delicious! Love the added crunch the granola gave! I made this recipe this morning (minus the granola) because I needed a basic pancake recipe. My kids like their fruit on top of their pancakes so I did that instead. These were the best pancakes ever!!! My little guy was eating them plain and his eyes lit up! Tasted so much like the Irish Soda bread we made yesterday. Looks like I’ll be keeping buttermilk in the house as these are our new favorite pancakes!! Thanks Maria! Congrats on your 2nd boy ;-)! Can I substitute something in place of the canola oil? Yes, melted coconut oil works well or you can even use melted butter! I made these pancakes this weekend and they were delicious! Of course I love all of your pancake recipes. I added the granola, but they would still be perfect without. This is going to be my basic pancake recipe now. I didn’t have buttermilk, so i used 1 cup plain yogurt and 1 cup milk and it worked great. Thanks for the amazing recipe! I agree with Katrina! I had never thought to add granola- that is a great idea!